The Sunseeker 3250DSLE are our largest unit with sleeping for up to 10! 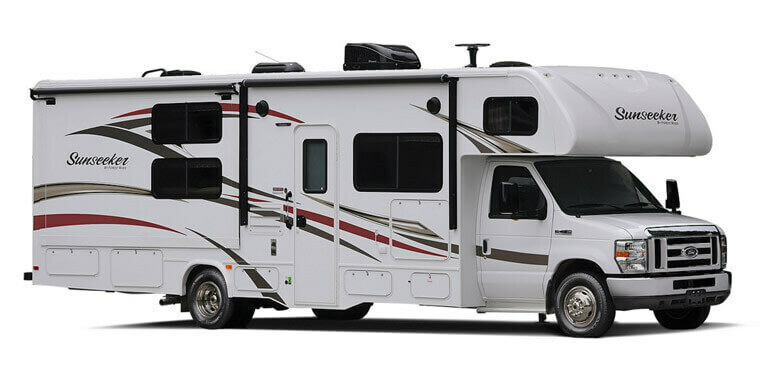 There 32’ two-slide unit will easily house the whole family. They feature a queen bed in the back, sleeping over the driver, a dinette and couch that both convert to beds AND a convenient bunk area for the kids. Rear bedroom has a queen size bed, two cabinet closets, and the shower is in the bath giving tons of space to shower and get ready. Back up camera, and Pioneer touch screen am/fm/MP3/CD/DVD Dash Radio.